So You Want to Fly Balloons? 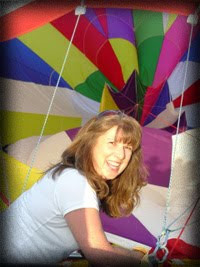 This is part two of my e-interview with commercial balloon pilot Kathy Lee, the operator of SpiritWind Hot Air Balloons. Part one of this story is found here. World of Flying: Describe the ongoing training you do throughout the year to stay proficient, and what types of FAA regulations you must adhere to in order to stay legal to fly passengers. Kathy Lee: As with any pilot, FAA requires that in order to act as pilot in command, the pilot needs to have 3 take offs and 3 landings in the aircraft in which he/she holds a certificate, also must do a flight review and ground school with a CFI (commercial flight instructor) every 2 years. WoF: Is it hard or relatively easy to fly a balloon? Describe a takeoff and landing. KL: Of course take off and landings are the most crucial aspect of any aircraft. The pilot must first find equilibrium, the point at which the basket is hovering just above the ground, and then heat the envelope to the point at which it will rise at a controlled rate. Landing is best with passengers when you can perform a glide slope landing, bringing the balloon to parallel with the ground and gently setting down, however, there are many safe approaches and it is not uncommon for a balloon landing to involve some tilting and dragging of the gondola as well and still be safe. WoF: What is the most dangerous thing that can happen to a balloon pilot if they are not tuned in to the weather. KL: Oh my, I can not even imaging a pilot not being in tune with weather. As a balloon pilot, I am not only in tune with the area in which I am flying, I want to know what is coming my way within 50-100 miles. The worst peril will be the wind, wind shears and lightening. WoF: What does a balloon cost to buy and maintain. Also tell us if they require an annual or 100-hour inspection, and also what it costs you to fly a balloon one nautical mile (in general terms). KL: Plan to start at $25,000 for new sport balloon, this will include the envelope, burner system and gondola, up to $50,000 and beyond for special shape commercial balloons. Used balloons are available at much lower prices depending on what you might be in the market for. One might plan on spending at least $350 on the annual if there are no repairs, if repairs are needed then that can become rather expensive as well. The insurance will depend on the percentage of commercial time you have. More than the price of the propane is figured in with the cost of a flight. The balloon is powered by propane which might take, depending on the temperature and payload, 30-45 gallons for a regular sports balloon, which in that case, can cost about $70-100. This depends on the price of propane at the time. All hot air balloons are registered aircraft and therefore fall under FAA required 100 hour or yearly inspections at which every inch of the envelope is inspected, checked for porosity and must pass a pull test for fabric durability, the burner is inspected and serviced, the basket (gondola) is inspected for integrity, and all the proper paperwork required to be carried in the aircraft including the airworthiness certificate. WoF: Have you ever scared yourself while flying a balloon? KL: Early on as a private pilot, I had done my flight planning, it was a very warm summer afternoon, flight services told me there was nothing on the radar as far as cells indicating lightening. I was flying alone getting some time logged, my son and a friend were on the ground chasing, I looked ahead a very short distance and suddenly saw a small cell with lightening in it, I immediately searched for a landing site, set down safely and packed up. Since then I am very cautious when the humidity is high. WoF: What was the craziest thing a passenger has ever done while on a balloon flight with you. KL: I had a couple celebrating an anniversary, she sat on the floor of the gondola for more than 1/2 the flight! I have also had proposals, flights after weddings and the list goes on, Each flight is amazing! WoF: Balloons are considered romantic...why is that? KL: I think that songs and movies have a big part in bringing romance to being suspended in the air in a basket floating above the earth with the one you love and it has been my experience, that is true in every sense with all my passengers. WoF: Describe your favorite balloon flight of all time, where, when, and why it was your favorite. KL: My favorite flight was in Gallup, New Mexico in the Red Rocks. I launched from the valley, rose gently as I floated against the smooth red rocks and could actually reach out and touch the rocks as my basket hugged the contour of the surface then continued on to fly over the peak of the mountainous rocks, down into the next valley and on to the beauty of the rocks ahead awaiting my balloon's arrival. It was totally exhilarating.